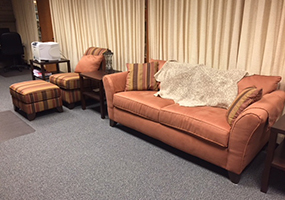 The Center for Innovation in Teaching and Research (CITR) in cooperation with the University Libraries has created a faculty lounge in Malpass 517/518. 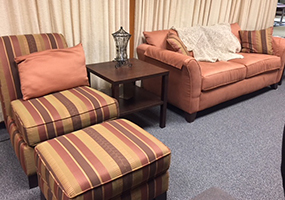 The Malpass faculty lounge has been created to provide WIU faculty with an exclusive collaborative space. The lounge is made up of two spaces, Malpass 517 has been structured as a small (5 or fewer individuals) meeting space while Malpass 518 has been designed as a learning, collaborative, and gathering spot. 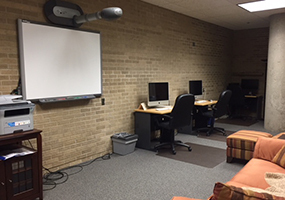 This space has been equipped with: Two PC's and two IMacs, Networked Printer, Scanner, Electronic White Board, Combination VCR and DVD Player that has been hooked to the White Board, and a telephone. 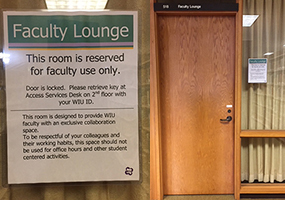 The faculty lounge is locked during the day. Faculty can check out the key at the circulation/access services desk. Click here for library hours. 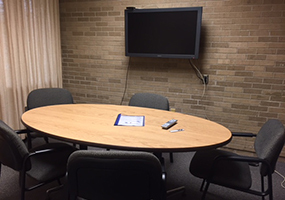 The faculty lounge has a small private meeting room, which is equipped with an Apple TV and large screen TV. 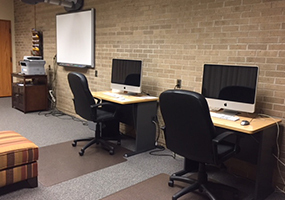 The room is a great place to electronically connect with others who are off campus with the use of a MacBook, which CITR can provide. Call 298-2434 or contact CITR at CITR@wiu.edu to reserve the room.